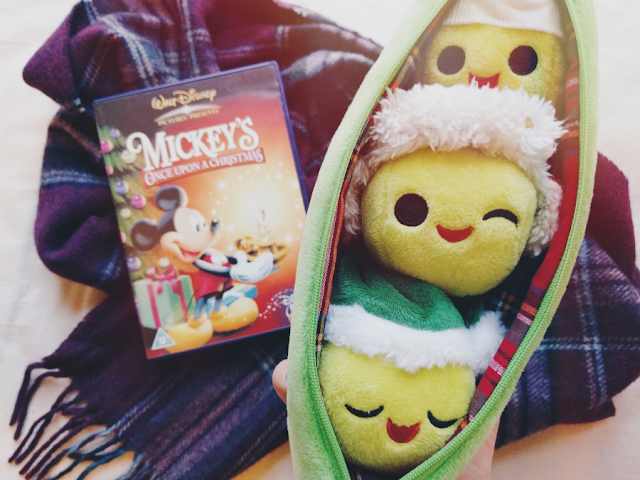 ...How adorable are these Christmas 3 Peas In A Pod?! Merry Christmas lovelies! Before we begin I thought I'd better do a quick update - although I'd been planning on doing a "12 Days of Blogmas" this December (12 Blogmas posts every other day from 1st December to 23rd December) my phone ended up had a major electrical fault last week... God bless technology eh?! Luckily I managed to get a new phone under warranty on Saturday but this has unfortunately put me very behind schedule as I wasn't able to blog in the meantime so I've decided to just do as many of my planned Blogmas posts as I am able to do. So for today's Blogmas post I thought I'd do The Christmas Tag, created by The Enthusiast so you can find out a little more about what makes up my Christmases. Let's begin! It's got to be Love Actually! I'm a total romantic so this film is right up my street. Plus that cast. Christmas time is never complete without at least one viewing of this film. Never! We don't really get snow full stop where I live so it's pretty unlikely unfortunately! At home with the family. The last few years on Christmas day have been pretty chilled out and quiet as it's usually just my mum, sister, the dogs and myself but this year there will be a point over the Christmas period where we'll have six people and five dogs all under one roof! There's so many but probably Driving Home For Christmas by Chris Rea. I've never actually driven home for Christmas but the idea of this song always makes me feel so happy and Christmasy! No, we usually open all our presents on Christmas itself but if anyone gives me a present before Christmas day then I always open them right on the spot, much to my mum's annoyance! The Christmas day walk on the beach with the dogs (which should be especially interesting this year as we'll have five dogs instead of our usual two!) and sales shopping with my sister on Boxing Day, followed by our big family meal! We always have an artificial tree at home but when I move out to live with my boyfriend I'd love to have a real tree at least once! Honestly I love finding that perfect gift for someone and seeing their face light up when they unwrap it, but I always get stressed out at Christmas trying to get gifts together for everyone, so for Christmas-time I'd probably have to say receiving gifts haha! Last Christmas my sister bought us tickets to see the Harry Potter and the Cursed Child play so I have to say that's a pretty hard gift to beat! You can see my spoiler-free thoughts on the play here if you're interested. I have two! The first is Disney - I haven't experienced the Christmas period there yet so that's a definite goal for me! And the second is New York. It always looks so dreamy when its featured in Christmas films! Fail miserably, definitely! I've never been a natural present wrapper and I always have to google how to fold the paper each year as I somehow always forget?! I have to admit there isn't really one that sticks out over the rest! I'm very lucky because I don't think I've ever had a bad Christmas so I have lots of equally-lovely memories. I don't think there was ever a moment where I was like "OMG HE'S NOT REAL?" - I think we always kind of knew he was make believe! 16. Do you make New Years' resolutions? Do you stick to them? I don't make them just because I never stick to them! I do however make monthly resolutions and I find these are a lot more effective for me - I've managed to increase my water and fruit and vegetable intake through monthly resolutions! Family! The Christmas/New Year period are all about family for me. It's usually the only time of year that I see certain members of my family so it's very special to me. Hope you enjoyed this post! Hopefully see you soon for another Blogmas post!